Iceland is a country well known for its waterfalls. 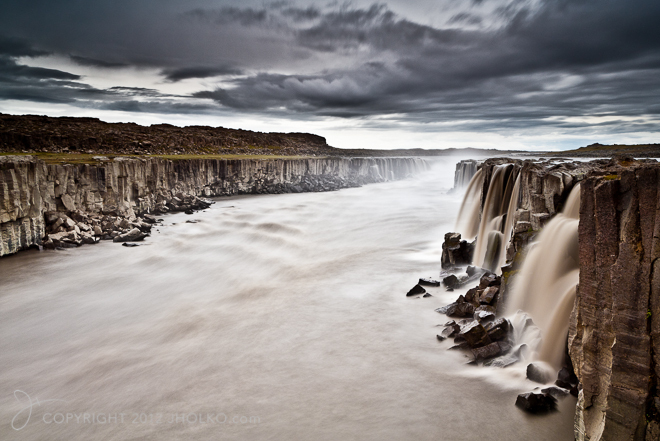 One of its most famous is Selfoss; a waterfall I made several repeat visits to during my 2010 trip. What makes Selfoss so unique and other worldly is the way it cascades down both sides of a deep rocky canyon. I have not seen such a geological feature anywhere else in the world and as far as I know it is unique to Selfoss and Iceland. The light was very different on my second visit to Selfoss and on this occasion a storm was building and dark storm clouds were racing across the arctic sky as I set up my tripod to take this photograph. The water has an almost chocolate colour as it is glacial and full of sediment from melting glaciers upstream. Not long after I made this exposure it began to rain heavily and I was forced to abandon any further shooting; but it didn’t matter as I had the photograph I wanted and an image I have titled ‘Selfoss before Storm’. A higher resolution version of this photograph can be seen on my primary portfolio website at www.jholko.com under Iceland. Limited Edition Fine Art Pigment on Paper prints are available of this photograph through Source Photographica in Brighton. Love it! I’ve been following your blog for a while and am constantly inspired. Also I’m from Christchurch, lived in Australia, now live in Norway and been on holiday to Iceland (Selfoss June 2011: http://www.flickr.com/photos/rustybones/5922283184/in/photostream/lightbox/). And am aspiring photographer. If you ever find yourself up in Northern Norway feel free to look me up, I’ll be more than happy to show another photographer about. Your pictures are amazing and stunning.